SICK offers a comprehensive portfolio of Magnetic proximity sensors in cylindrical (MM) and square (MQ) configurations. The MM sensors are available with standard sensing ranges and, in the Advanced series, with extended sensing ranges. With the use of newer and smaller magnets, it is possible to solve a wider variety of applications than ever before. 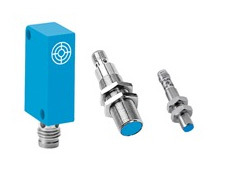 The Namur version of the MM Magnetic Proximity sensors completes the series and is designed for Explosive Atmospheres. Each of the SICK Magnetic Proximity sensors can detect targets through walls. CIMTEC Automation is an authorized SICK sensor distributor and can recommend the ideal sensor for any industrial application. Our in-house technical support team can help integrate the right sensors into any automation control scheme to optimize the superior quality and precision of SICK’s sensor products.